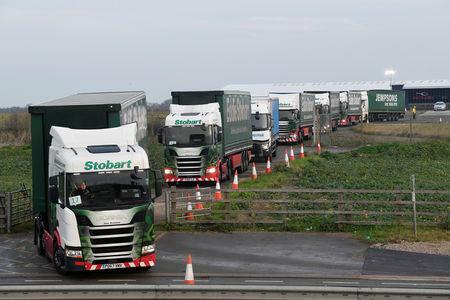 MANSTON, England (Reuters) - A convoy of nearly 90 trucks rolled through the southeast English countryside to Britain's main port to continental Europe on Monday in a government test-run for a potentially chaotic Brexit that was mocked as a farce by opponents of the split. Prime Minister Theresa May is trying to force her Brexit deal through parliament but lawmakers are expected to reject it. If so, business chiefs and investors fear the world's fifth-largest economy will leave the European Union at 2300 GMT on March 29 without an agreement on their future relationship. With parliament deadlocked, the ultimate destination of the Brexit project remains unclear. Possible outcomes range from another referendum on European Union membership to a disorderly departure with no deal. May's government has repeatedly warned that a no deal will lead to severe economic disruption, and Monday's exercise was part of preparations to ensure essential supplies can keep flowing through Dover, Europe's busiest ferry port. The transport ministry said it was testing Manston airfield as a holding facility for lorries and traffic congestion on Kent roads in the event of disruption at the border. Setting off from Manston, 87 trucks drove the 20 miles (32 km) to Dover and back again. They then drove again to Dover. Hiring the lorries cost 48,950 pounds ($62,484), the transport ministry said. The 'war game' was criticized by lawmakers as a waste of time and money and mocked on Twitter as "a fake traffic jam ... to show the EU we are ready for no deal". Britain's Road Haulage Association (RHA) said the trial was too little, too late and would need to be repeated to properly stress-test the management of thousands of lorries. "Less than a hundred lorries is a drop in the ocean compared to the more than 10,000 that go to the channel ports every day," said Charlie Elphicke, a Conservative lawmaker for Dover. "Sending lorries across Kent on a wild goose chase to Manston airport and then to the port of Dover by small and winding, often single track 'A roads' through Kent villages is not the right plan." Dover has been Britain's most important gateway to Europe since Roman times and the port now handles 17 percent of the United Kingdom's goods trade. Up to 10,000 trucks a day pass through with everything from perishable food to medicines. Layla Moran, a Liberal Democrat lawmaker who wants another referendum on EU membership, said the truck journey would not convince the EU that Britain was ready for no deal. "This is a taxpayer-funded farce," Moran said. Brexit supporters say that, while there may be some short-term disruption, in the long-term the UK will thrive outside the EU, which they cast as a doomed and excessively bureaucratic project dominated by Germany. But pro-Europeans fear Britain's exit will hammer the economy and undermine the West as it grapples with Donald Trump's unpredictable U.S. presidency and growing assertiveness from Russia and China. "Today’s trial cannot possibly duplicate the reality of 4,000 trucks being held at Manston airport in the event of a no-deal Brexit," the RHA's chief executive Richard Burnett said in a statement. "It's too little too late -- this process should have started nine months ago. At this late stage it looks like window dressing." Facing defeat in parliament last month, May postponed a vote on the withdrawal agreement she negotiated with the EU and pledged to seek further political and legal assurances from the bloc. The EU has signaled it may try to allay the fears of May's critics but will not renegotiate the deal. May said on Sunday that Britain would be in uncharted territory if her Brexit deal is rejected by parliament. A vote is due around Jan. 15. "It's still hard to see any upside to Brexit," said Mike Hawes, chief executive of the Society of Motor Manufacturers and Traders (SMMT), which said new car sales in 2018 fell at their fastest rate since the global financial crisis a decade ago. "Everyone recognizes that Brexit is an existential threat to the UK automotive industry and we hope a practical solution will prevail," he said, calling for lawmakers to support May's deal to guarantee a transition period. Britain's main opposition Labour Party is expected to back a proposal on Tuesday that could mean the government needs parliamentary approval for a no-deal Brexit. The European Commission repeated on Monday that EU leaders would not renegotiate the Brexit deal agreed with May, who said she was seeking further assurances from Brussels on the deal. "The deal that is on the table is the best and the only deal possible," chief spokesman Margaritis Schinas told reporters when asked about a phone conversation on Friday between May and Commission President Jean-Claude Juncker. "This deal will not be renegotiated."